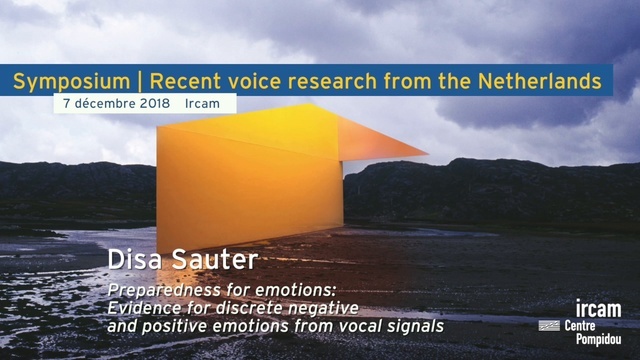 "Preparedness for emotions: Evidence for discrete negative and positive emotions from vocal signals"
We all have emotions, but where do they come from? Functional accounts of emotion propose that emotions are adaptations which have evolved to help us deal with recurring challenges and opportunities. In this talk, I will present evidence of preparedness from studies of emotional vocalisations like laughs, screams, and sighs. This work suggests that a number of negative and positive emotional states are associated with discrete, innate, and universal vocal signals. "Prediction in voice and speech"
Prediction in voice and speech processing is determined by “when” an event is likely to occur (regularity), and “what” type of event can be expected at a given point in time (order). In line with these assumptions, I will present a cortico-subcortical model that involves the division of labor between the cerebellum and the basal ganglia in the predictive tracing of acoustic events. I will discuss recent human electrophysiological and fMRI data in line with this model.